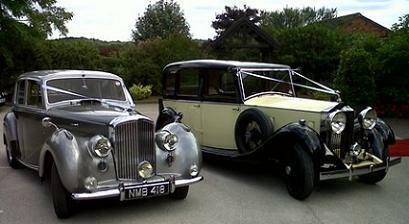 Derby Bentley Wedding Cars are one of Derbys longest, if not the longest established wedding car provider. Our family owned, Derby based wedding car business has been operating for over 25 years. Over the years many, many hundreds of brides have been chauffeured to traditional & civil ceremony's. We also receive numerous recommendations from family and friends of our happy brides and grooms. Our wedding car fleet includes Rolls-Royce and Bentleys cars from the 1930's and to Rolls-Royce and Bentleys from the 1950's. What better wedding cars could you have to compliment your special day.